Don't be in a hurry to leave this site for it's not just another catalogue of enticing promises where you end up being let down at the same uncertain place you were before. If panic-free speaking is important to you just stay where you are for a moment or two. In fact my telling examples and inspirational 'live' audio interviews in the following few paragraphs could well change your life! So why wait any longer?! If you're really serious about banishing your debilitating fears for good, put some of your precious time aside to actually go through the mind-opening ideas and inspirations revealed below on this Home Page for they'll introduce you to a panic-free path of real Hope in being the Confident, all-round communicator you've always wanted to be! 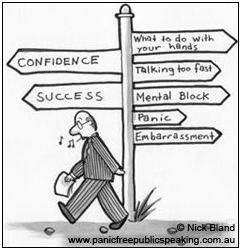 My credentials in leading you to this new path of speaking confidence are well-earned for I’ve also suffered the fear, panic, sweaty palms, knocking knees and debilitating effects of more than one humiliating public speaking disaster! But no more. As a person who now confidently public speaks and coaches speakers for a living, and have done so for decades, I can show you just how easy it can be by way of my hard-earned secrets for I now have the right mind-set and process to make it happen. It is this positive mind-set and pre-talk process that will put you in control of each speaking situation rather than let faulty thoughts and fears run your thinking and go on holding you back. What makes my learning programs so refreshingly different is there are no set, formal public speaking ‘rules’ and body language techniques to sweat over and ‘perfect’… which neatly sidesteps one of the greatest fears of all, ‘getting something wrong’! Released from these inhibiting shackles, you’ll now be free to stand tall, look your listeners in the eye, and confidently speak as the imperfect human being you are so they can relate to you and what you are saying. And we're talking about all types of public speaking situations here, such as giving a business presentation, speaking at a conference, wedding or funeral, addressing members of a club, union, church, parent's association or similar body, making a presentation to a retiring workmate or simply injecting life into a boring sales spiel. 1. A limited and non-threatening pre-session preparation to set you up for your speaking success that follows none of the traditional out-dated public speaking 'rules'. This preparation does not require you to speak before groups as you're still locked into your old debilitating ways of thinking and not walking your new path of speaking Confidence yet. But this simple and enjoyable task will start making a dramatic difference to your communicating effectiveness in itself and let you in on the secret of why others make it look so easy. You'll now be imbued with real Hope for your speaking possibilities! 2. An inspirational half-day mind-opening session with me personally builds on this unique preparation in an exponential way so that by session's end you're already walking this new path of speaking confidence and more than eager to put it all into practice in your personal and work situations! 3. This practical 'awakening' done, you're by no means left by the wayside and forgotten. My promise of ongong email coaching help for as long as is necessary will ensure you are set up to stay on your path of speaking Confidence and never go back to the awful place of self-doubt and fear you once lived in.... all with my money-back Guarantee! Sceptical?... Too good to be true? Before I commit to anything I need you to be aware of the circumstances which have brought me to this point as I’m naturally sceptical that the training you promise can overcome my situation in such a short space of time. I not only suffer from presentation anxiety but also anxiety in confrontations and meetings. A real, palpable fear that sees my heart racing, my skin go red as a beetroot and my voice crack. I’ve been to see psychologists and hypnotists and yet 12 months into my experience of anxiety it’s still there, albeit less intense than when I was initially diagnosed with it. I’ve learnt to cope with it, as opposed to beating it. So ingrained is my presentation/confrontation anxiety, I really can’t comprehend that you can change my thinking sufficiently to have long-lasting effect in just half a day even with ongoing help. If it works I’d be more than happy to pay you your fee as this fear is destroying my confidence and even my social life. BUT I’ve spent an awful lot of money on therapy of all different kinds and I don’t want to throw more money at the next miracle cure. I see so many advertised and it’s hard to know if they really can help. My reply reaffirmed my money-back Guarantee and that the onus was entirely on me to deliver the speaking confidence the others had missed – with unlimited follow-up help if required. With nothing to lose and everything to gain Jesse had one last desperate throw at the dice and gave me a go. Four weeks later I received payment for promised outcomes delivered and a profound “Thank You” for setting him free from the crippling fear that had dogged him for so long. And I can certainly do the same for you. A tried-and-proven training program to open your mind to Confident Speaking without the self-doubt and fear. This exciting learning experience is gentle and without scare tactics. My role is straightforward and simple: To safely lead you to being the confident speaker you never thought you could be. In order to communicate with confidence you've got to first believe that you can. Therefore, we identify the faulty thinking and negative conditionings that have been holding you back and supplant them with entirely new patterns of speaking success to inspire your ongoing personal growth. With your new belief system and right to speak firmly in place, you're now ready for step two. When it comes to 'Being Yourself' while speaking before groups it's easy enough to say - but not so easy to do! Here we don't simply rehash a lot of empty words and outdated ideas. In an interactive, non-threatening way, we show you precisely where to find the real you and be in control of your own person. Utilising your 'newly discovered' speaking talents you'll now enjoy a freedom of expression few people get to experience. And because you now recognise your strengths and know how to make the most of who you are, each person in your audience will feel you're talking to them personally. You are now ready for step three where you'll learn the simple secrets of confidently creating and delivering a successful talk that engages people. With the barriers of Why you Can't no longer in your way, your mind is now free to understand the simplicity of my hard-earned public speaking secrets - the practical things I personally do to ensure my presentations are always interesting and engaging. Here you'll discover just how easy it is to make speaking confidently before groups whatever the situation, an enjoyable part of your world. By way of mind-opening ideas and practical insights you can relate to, you'll not only gain, but consolidate your new found confidence, knowledge, know-how and self-belief to create and deliver your own effective presentations from this point onwards – with the support of my ongoing help. Some time back I ran one of my exciting training programs for two senior management staff at one of Melbourne’s leading golf clubs. My brief was to give them the confidence and know-how to effectively MC a very important function at which many notable people would be in attendance. Their concerns were very real for this had to work and there was no room for failure. Yet by the end of this paradigm-shifting experience both of these people were able to proclaim that their nerves were now under control and they were actually looking forward to this glittering occasion. Before I walked away they shared something very interesting with me. I learnt that after enquiring about my services, they had made further enquiries with other extended public speaking courses. “Boy did they tear shreds off you!” one of them confided in me. She told me that one guy told her: “It simply can’t be done in one session… You need a longer course in which to practice”. He told her that he’d been in the business for 20 years and it would be an absolute waste of time and money to even consider it. She then went on to say: "As time was a big factor in our decision, your sheer conviction and Guarantee swayed us to believe you could deliver what you promise in one interactive session and that’s just what you’ve done!" With their newfound confidence, my promise of further help and a step-by-step running sheet as a safety net, the evening was an outstanding success and both of these people have since gone on from there. This choice of speaking success by design is also yours. Thank you Laurie for your extra help with the important meeting they sprung on me last week - with all the top executives to be in attendance I was in a real dither! It certainly is refreshing to have someone fulfil their promise of being there to help long after the training is finished. I got lots of great comments and all went as planned. Thank you so much for all your Extraordinary help over the years. Wishing you continued quintessential success always as you inspire others to their greatness. You can't lose with my 100% no-questions-asked money-back Guarantee. My sole purpose is to lead you to the safe place of speaking before groups with the firm belief that you now know What to say and How to say it with Confidence! At session's end I want you to be able to say, " I actually look forward to my next talk!.. The whole process of gathering my thoughts, preparing myself mentally, and delivering what I have to say with confidence now seems so easy.” At session’s end if you don’t feel this way and now know that you are firmly on a brand new path of speaking confidence you weren't aware of before, well if you can’t express these kinds of thoughts you simply don't pay me. But my aim is to permantly shift your thinking from "I can't" to "I can!" 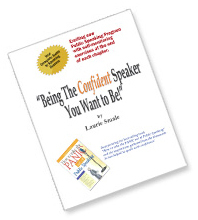 and arm you with magic little formulas and strategies that really work so you now believe in yourself as that Confident speaker you’ve always wanted to be. Think of this mind-opening half-day training experience (with ongoing help) as an exciting new doorway to a life of speaking confidence where you will be able to air your views in a confident way so people will respect who you are and what you are saying. You will have discovered what I now know as someone who speaks for a living and bypass all the heartache and humiliation that I had to go through to gain my priceless insights. You'll have them all on a platter, understand them, and add an exciting new dimension to your life just like I have done. So I must know what I am doing to be able to make such a bold money-back Guarantee. From Cautious Concern to Communicating Confidence! I was once pulled over by a young policeman for a routine check in a dark street of Melbourne with a car full of kids out looking at the Christmas lights. As I parked by the curb I thought 'I don't remember doing anything wrong? 'Licence please' the young constable politely asked as he went through the regulation breathalyser test. Then he paused, looked at me closely and said, "What's your name?" When I told him, something extraordinary happened. "It's because of you I've got this job" he said. "I had no self belief and was terrified of the interview and public speaking ordeals that faced me at the Police Academy. Your training session and coaching completely turned all this around." Somewhat stunned, it all came back to me as I got out of the car and stood beside this confident young policeman in his smart uniform. "My sergeant is sitting in the car watching all this so we better keep going through the motions," he said. When he had finished, I looked at him with a certain amount of pride and said: "I remember assuring you that you'd be a confident policeman, and here you are." For a moment words failed us and we just stood there. We momentarily forgot the role we were playing for the benefit of the watchful eye of his sergeant and warmly shook hands. My kids were intrigued with all these goings on too! I drove away inspired with the feeling that what I do in helping people overcome their public speaking fears and self-doubt works like magic, and again, I can do the same for you. And a similar story with Mary. Mary was a young doctor about to face the traumatic experience of the oral part of her medical examinations where she had to diagnose real patients before a formidable audience of noted medical people and then be cross examined by those all-powerful medical people above her! Her whole future was at stake and she was absolutely terrified! She was fearful of making a mistake and looking a fool. She was fearful of misdiagnosing the problem and getting medical terms wrong. And she was fearful of being at the mercy of those who had a profound influence over her very career as a doctor! Mary was no longer in control as the competent, locum doctor diagnosing and treating patients she had been for the last three years. She had become a helpless victim of her own perceived fears. One of which was even if she did the session with me how could she be certain things would go well on the day? As our mind-shifting session progressed, Mary began to 'discover' that she was indeed knowledgeable about her subject through study and practical experience with real patients and she started to see things more clearly. Pretty soon her ingrained fears no longer seemed the 'Mt Everest' she thought they were! After all, she had been working as a consulting locum for the past 3 years where her patients naturally trusted her as the medical expert who would look after them and their ailments. In these situations she was the person in control expected to make the diagnosis and prescribe a possible remedy for these trusting people. When Mary realised that the real patient in her oral exams would probably be more nervous than her, she understood that it was beholden on her to be in control of this situation too and simply replicate what she'd been doing successfully in her consulting rooms for 3 years! In fact by sharing each step of this real-life analysis 'out loud', the mental connection with her examiners would be two-way because they'd be thinking about what they'd do in this specific situation too! Now things would be on an interactive human level and not be classic public speaking at all! And it would be the same with their questions for her answers would be based on her diagnostic assumptions of what had just happened with this real person. The whole thing would take on the air of a dynamic 'medical conversation' between like-minded experts about something that had just unfolded before them. Most important of all Mary 'twigged' that all of these simple strategies would humanise things and take a lot of the pressure off her! Mary could now see it was only fair - and to her advantage - that her focus be 100% on the patient's health and well-being instead of being solely on Mary and her perceived shortcomings and fears. She now accepted the fact that everyone gets a little keyed-up and nervous in an exam situation, it's only natural. But normal healthy excitement and adrenalin is a lot different from being at the mercy of crippling fear during the lead-up to an exam and the actual event! By the end of our face-to-face learning experience, Mary realised that it was her faulty thinking that was holding her back and could clearly see that there was real hope for her. She was now actually looking forward to the experience rather than dreading it for she now had the tools and self-belief to do the job. In spite of the inevitable ‘exam nerves’ on the day, Mary got through it all with flying colours and is now a fully-fledged doctor. All she had to do was be true to herself and her own self-worth and follow our simple process. These human experiences continue to reinforce my deeply held conviction that my approach to transforming self-doubt and fear into public speaking confidence and effectiveness is unique and works like magic. So why not join the thousands who are now confident public speakers and communicators because they’ve gained the confidence to speak up and stand on their own two feet, accept who they are and now see things differently. A transformed belief system from "public speaking terrifies me" to "I eagerly look forward to my next presentation!" Venue: I come to you anywhere in Australia, or you come to my Box Hill North studio in Melbourne. Either way suits me fine. *All testimonials on this site express the personal views of the writer on how they feel about their experience with my training and publications. Some names have been changed for privacy reasons. It's important to note that the results may vary from person to person for some fears are so profound they need extra help. This is where my promise of ongoing coaching comes in so you stay on your new path of speaking confidence and are never left to flounder.